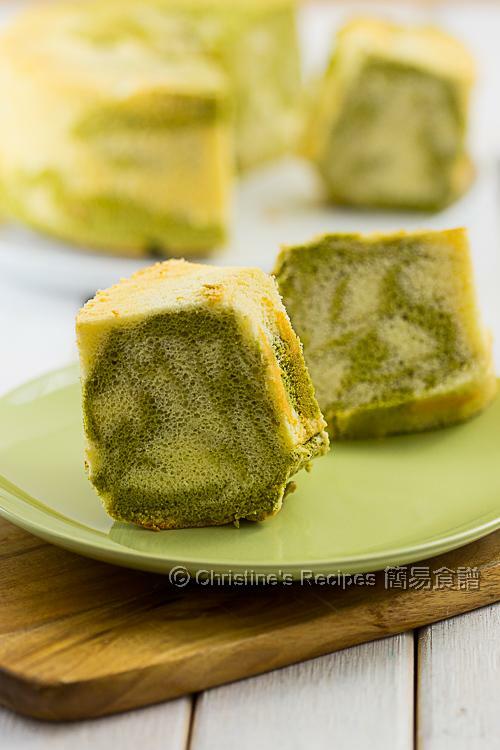 This matcha marble chiffon cake is very soft and fluffy as a cloud with a pleasant aroma of green tea. I’m so fond of the aroma and colour of matcha (green tea). By adding a little bit of it into the cake batter, I can get a very fresh smell and lovely green colour for this marble chiffon cake. The cake is very soft and fluffy as a cloud. The marble effect is very easy to make. All I have to do is to use a pair of chopsticks to draw freely in the batter. I’d be amazed by the different patterns created every time I bake this cake. In this video, you'll see how easy and fun it is to make the marble pattern. As for myself, baking this marble chiffon cake is not only cooking, but also a leisure game. There’s nothing can beat a piece of matcha cake with a cup of tea. Do you want to join in to play the drawing marble pattern game? Top left: beat egg whites & add cream of tartar. Top middle: add sugar. Bottom left: add matcha liquid into one part of batter. Bottom middle: lightly stir the combined batters with chopsticks. Preheat oven to 170C / 335F. Mix the matcha powder and warm water very well. Make sure there are no lumps at all. Set aside. Sift the cake flour and baking powder together and combine well. Set aside. Prepare the yolk batter: Mix the egg yolks with 40 grams of sugar until smooth. Pour in the milk. Combine well. Sift in the flour mixture in three additions and incorporate well. Stir in the oil bit by bit until you get a smooth batter. Fold in one-third of the egg whites into the yolk batter at a time. (Also, here’s a video of showing how to fold-in the egg whites). 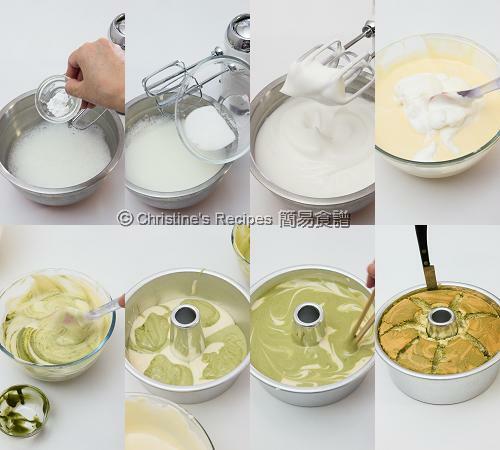 Divide the batter into two parts. Stir in the matcha liquid into one of them. Pour in the two parts of batter into a non-greased chiffon cake pan alternatively. Use a pair of chopsticks or skewer to stir the batter a few circles lightly. Bake in the preheated oven for 35 to 40 minutes. After the first 15 minutes, reduce the oven temperature to 150C / 300F. Continue to bake until it’s cooked through. An inserted needle comes out clean. Remove from oven and immediately revert the cake pan upside down on a wire rack. Let it cook completely. Carefully remove the cake from the pan. Enjoy ! Try to get quality matcha powder that gives a vibrant green. This time I used Japanese Ujinotsuyu matcha powder (宇治綠茶). Feel free to use any oil at hand as long as it doesn’t have a strong smell. Wow, tks Christine for sharing. I love the eveness of the cake texture. Another to do on my list. May I omit the baking powder? Of course, you can omit the baking powder. Make sure you don't knock out the air when fold in the egg whites and make the swirl. I just love those green swirls...absolutely stunning! Just baked this cake. Very spongy and soft. Thanks christine for sharing. I tried a few of your recipes and I found them really nice. Would like to know if it is 170C of a fanforced or convection oven . All oven temperatures on this blog are for conventional ovens. If fanforced mode is used, will be specified otherwise. Thnaks for the detailed recipe! May i know what's caster sugar? Can i replace it with normal sugar? Also, my family love green tea, it it possible to increase the amount of green tea powder? Caster sugar is very fine white sugar that can be dissolved very easily. Yes, you may use normal sugar, but make sure that it's well dissolved. You might increase the amount of green tea powder to your liking. What is the difference between green tea powder and matcha powder? Is it the same? Can I use green tea powder for baking? Matcha is green tea powder, milled from shade-grown tea leaves to prevent direct sunlight, with vibrant green in colour. When a product is just called green tea powder, it could come from any part of the plant, not always the leaves. 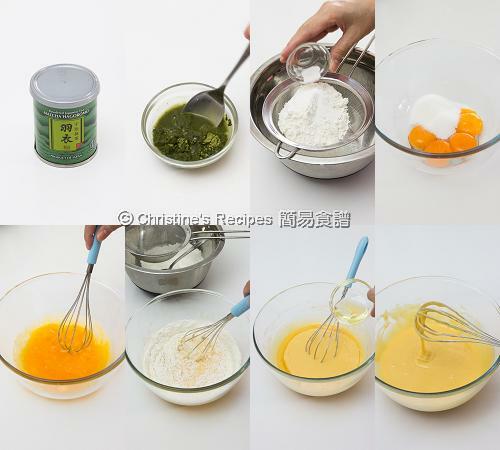 If you have green tea powder at hand, you can use it in baking. The colour of the end product would be a bit yellowish. How about the taste between green tea powder and matcha? Matcha is far better and has a stronger green tea aroma. I tried your recipe today. The cake is now cooling inverted :) It rose nicely eventho I used a 10in(top)/9in(bottom) tube pan. The only problem I encountered was mixing the matcha paste with the final batter. The matcha paste was dry and it took me a while to mix it with the final batter. While mixing I was worried I would deflate the meringue too.. so I end up mix till there are still specks of the matcha paste and quickly pour into the baking pan. Any tips on mixing the paste well into the final batter without taking too much time? Every brand of matcha is slightly different. If your matcha paste is too dry, it needs a little bit more water to dissolve. But not too much, it will hurt the texture otherwise. The matcha paste is thick but not too dry. Once you get the matcha paste ready, take out a little portion of the batter to loosen it first. Then mix it with the remaining batter. It'll be much more easier to fold in well and don't need to take too long. Silly me! I just realised you have a video on your mixing of the matcha paste! Please ignore my earlier questions. Your matcha paste looks fluid. Mine was dry paste. Will add more water tomorrow when I bake again. I tried again. This time I added water slowly till the matcha mixture is more liquid. The cake rose beautifully. But after cooled inverted, the top aank towards center. The cake texture is dense at this sunken area but fluffy in other areas (unsunken bottom). May I ask why? Good to know that you've got your matcha paste right. If the texture of your chiffon cake is too dense, it's probable that the air was knocked out from the batter for some reason. I've put two tutorial videos about how to beat egg whites and how to fold-in the egg whites on youtube. These two steps are very crucial to make a light and fluffy chiffon cake successfully. Please click the links on this post and have a close look. Hi, Christine. Thank you for sharing the recipe. I tried to bake the cake but unfortunately the cake sink almost half of the height when I took out from the oven compare to the original height when it was in the oven. Could you enlightened me what did I do wrong in this case? It's highly possible that the egg whites was not beaten or folded in properly. Please check the links on the sidebar for tutorial videos. Can I substitute the vegetable oil with butter? How much butter should I use then? Use the same quantity of melted butter then. Hi Christine, I love your site! 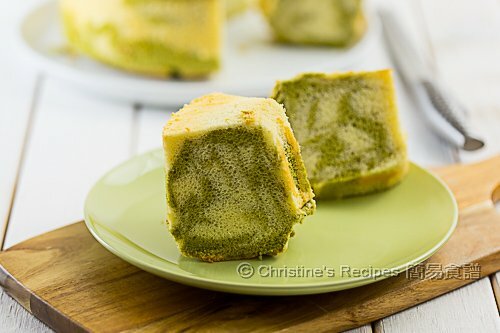 I would like to add the matcha mixture into the entire yolk batter, would you think the final result of the cake taste and texture be the same without the marble effect? A friend got me a box of matcha powder from Japan so I am really excited to try out this recipe. Yes, you can mix the matcha mixture thoroughly into the batter, not making any marble patterns. You might need a little bit more of matcha to get more green colour for the whole cake if you want. This was an excellent recipe. Thanks so much for sharing! Hi Christine...how wld i replace d cake flour and milk in d recipe esp for those on a ketogenic diet? Is it supposed that you eat high fat and low carb if you're on ketogenic diet? So cakes are not on your menu. Is that right? I made this...my first chiffon cake ever! It came out very nicely...airy, fluffy and not too sweet! a few comments for newbies like me. 1) my chiffon cake pan doesn't have a removable base. What I should have done is to line the bottom with parchment paper. 2) my matcha powder probably is not the best quality..probably should have used 3 teaspoons instead of 2 to have stronger taste and darker color contract. 3) i had to beat the egg whites longer than what the video showed, like 5-6 mins to pass the upside down test. I have saved the recipe and will try again shortly. thanks again for sharing! Hi Christine! I have a 10-inch chiffon mould. Please tell me how I can adjust the ingredients accordingly. Thank you. Your cake will fit in a 10-inch chiffon mould. Can I use a rectangular pan like the one for butter pound cake ? Your cake will look high enough as mine.